Microsoft has now officially released the Windows 10 April 2018 Update, so read on to find out how to manually download and install the April 2018 Update. Microsoft has started the automatic rollout of the update, but it may still be a while before your device gets the April 2018 Update. If you don’t want to wait, then follow the steps below to download and install the Windows 10 April Update right now. Before we demonstrate how to download and install the Windows 10 April 2018 Update, you should know that there is some inherent risk to installing major operating system updates, so we strongly advise that you backup your important data first. Luckily, we can show you all the best free backup software. Once that is done, read on to find out how to download and install the Windows 10 April Update right now. If you encounter any issues with installing the Windows 10 April 2018 Update, then check out our guide on Windows 10 April 2018 Update problems: how to fix them. If you’re experiencing issues with Windows Update, you can force your PC to download the Windows 10 April 2018 Update by using the Update Assistant tool. The tool will download, then check for the latest version of Windows 10, which includes the April 2018 Update. Once downloaded, run it, then select 'Update Now'. The tool will do the rest. 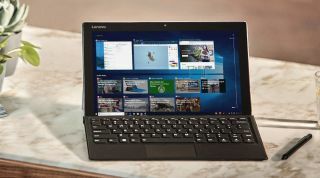 Your PC will restart a few times – so save any work first – and then your PC will be updated with the April Update, while all your files and settings will remain where they were. Remember, this will only work once the April 2018 Update is officially released. If you’re more into doing things yourself, there’s also a way to manually download the April Update 2018. This is a more complex way of doing things, however. Once the ISO file is downloaded, it can be burnt to a DVD or put on a bootable USB stick. Once done, load up the file and follow the instructions to install the Windows 10 April 2018 Update.